George R. Davies, Cheshire, England; sold 1913 to (Gorer, London); (Dreicer and Co., New York, agent for Gorer, London); sold 1913 to General Brayton Ives [1840-1914], New York; (his sale, American Art Galleries, New York, 8-10 April 1915, no. 119); (Duveen Brothers, New York and London); sold 1915 to Peter A. B. Widener, Lynnewood Hall, Elkins Park, Pennsylvania; inheritance from Estate of Peter A. B. Widener by gift through power of appointment of Joseph E. Widener, Elkins Park, Pennsylvania; gift 1942 to NGA. Burlington Arts Club, London, 1910. The slightly matte mossy green enamel displays some iridescence on the shoulders and sides of the jar. The underlying glaze, visible at the mouth rim and on the interior, is grayish white; the crackle appears to have been stained. 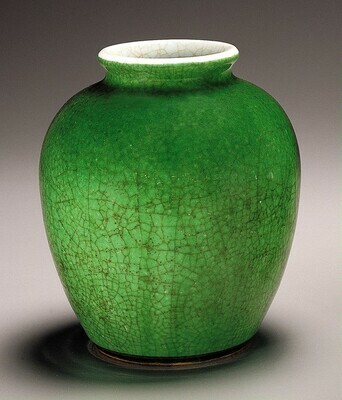 Both the underlying glaze and the green enamel end in relatively neat lines, but the green enamel flows evenly over the glaze onto the brown wash almost to the base. The base and the foot are unglazed and covered with a chocolate-brown wash. There is a chip in the foot-ring. A hole on the base that does not penetrate the body is an apparent firing flaw. An unusual amount of kiln debris inside this vessel imparts a rough texture to the interior. "Chinese Porcelain in the Davies Collection," The Burlington Magazine 23 (April-September 1913): 162-167. Collection of Old Chinese Porcelains formed by George R. Davies, Esq. Formerly of Hartford, Cheshire, and now of Parton, N.B. ; Purchased by Gorer and Exhibited at the Galleries of Dreicer & Co. London, 1913: 34, no. 159, pl.7. Works of Art from the Widener Collection. Foreword by David Finley and John Walker. National Gallery of Art, Washington, 1942: 21. Christensen, Erwin O. Chinese Porcelains of the Widener Collection. Washington, 1947 (rev. ed. 1956): 23; 1956, 23-24. Kopper, Philip. America's National Gallery of Art: A Gift to the Nation. New York, 1991: 197, color repro. Bower, Virginia, Josephine Hadley Knapp, Stephen Little, and Robert Wilson Torchia. Decorative Arts, Part II: Far Eastern Ceramics and Paintings; Persian and Indian Rugs and Carpets. The Collections of the National Gallery of Art Systematic Catalogue. Washington, D.C., 1998: 122-123, color repro.